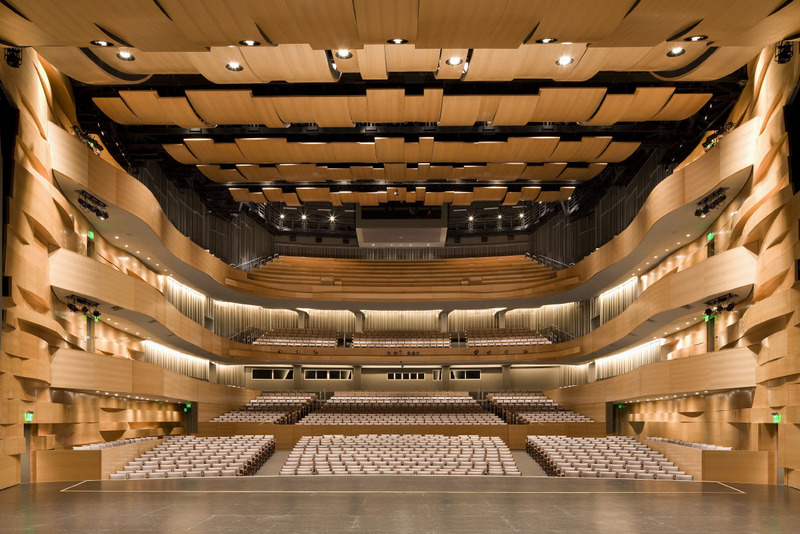 A world-class performing arts center harmonizes between town and gown, technology and energy-efficiency. 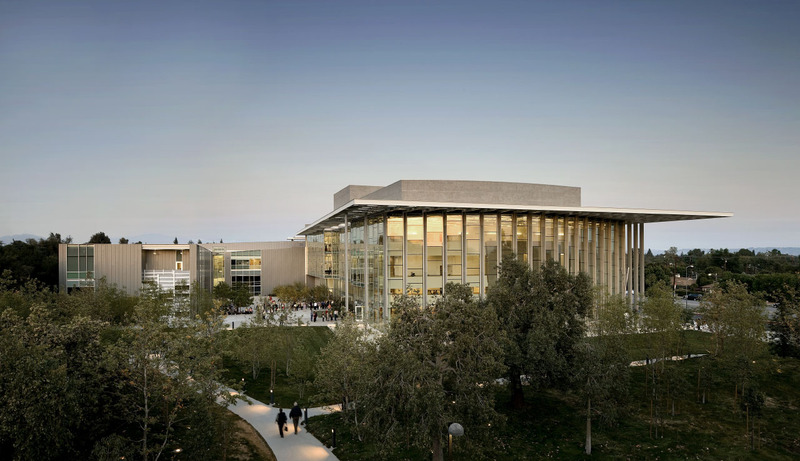 Located in Southern California’s San Fernando Valley, California State University’s Northridge campus (CSUN) is home to a new $125 million, 166,000-square-foot performing arts center. 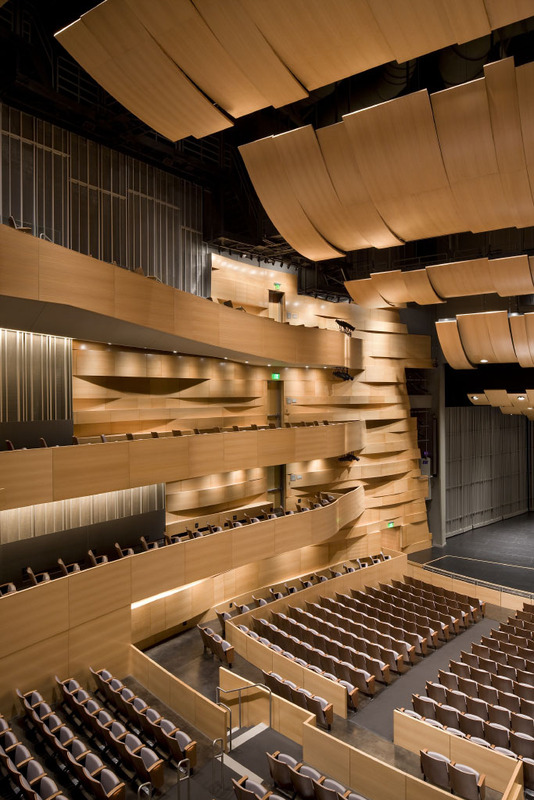 The Valley Performing Arts Center, certified LEED Gold, was designed by Minneapolis-based HGA Architects and Engineers, specialists in this facility type. The architects faced several challenges in creating a world-class center that incorporates advanced technologies without compromising energy efficiency and also redefines the campus edge while embracing the community. The Valley Performing Arts Center is comprised of two connected volumes that house a concert hall and its supporting spaces, situated around a U-shaped exterior courtyard. 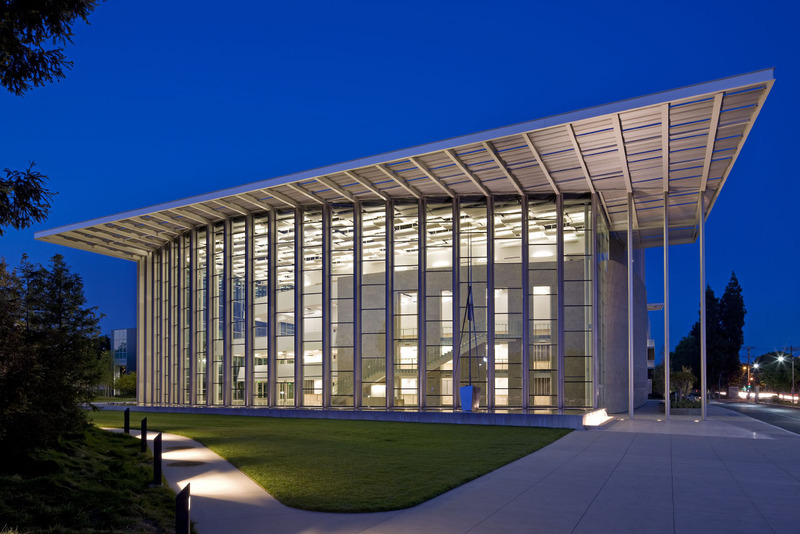 The complex was placed prominently at the southwest corner of the CSUN campus and provides a new gateway. A curved glass curtain wall along the lobby’s north and west perimeters is capped by a cantilevered rectilinear sunscreen. This overhang defines an exterior plaza paved with travertine that flows into the lobby, establishing a harmonious indoor/outdoor relationship. A reflecting pond and water features along the building’s base create music of their own, transitioning patrons from the busy street to the serenity of the lobby. Light filters through the curtain wall and illuminates the pale but richly textured interior surfaces. A grand staircase serves as a focal point, with railings built from staggered glass panels that establish a visual rhythm much like the keys of a piano. The Grand Hall contains three tiers with a total of 1,700 seats and accommodates a wide range of events, including orchestra and opera concerts, Broadway plays, film screenings, and dance performances. It’s not your typical bare-bones campus performing arts center: sculptural surfaces envelop the audience and make them feel as if they are the real stars of the show; side walls are clad with shimmering stainless steel mesh panels; and wood ribbons unfurl from the stage and weave along the ceiling and walls to wrap balconies, lending warmth to the voluminous space. HGA collaborated with theatrical consultants Auerbach Pollock Friedlander to design a professional stage-house complete with an 85' high fly tower with 60-line set rigging system. Performances are also enhanced by the use of a hydraulic stage extension/pit lift. Supporting spaces for the Grand Hall include two rehearsal spaces, a 175-seat black box theater, a 230-seat lecture hall, classrooms, offices and facilities for the campus’s public radio station. To achieve a high level of energy efficiency without compromising acoustics, HGA carefully designed the building’s HVAC system. It draws from the university’s four chillers for cooling and dehumidification, and heat for air-conditioning and water is recovered from two hydrogen fuel cells that feed the campus grid. 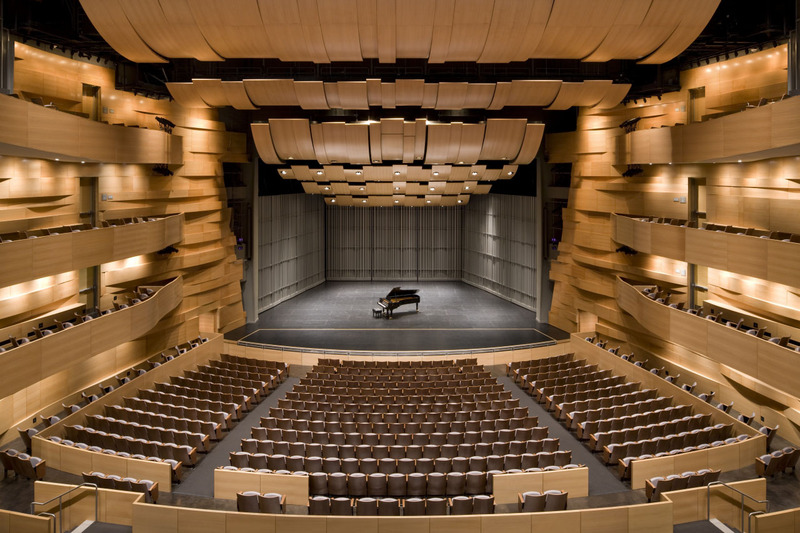 A displacement ventilation system serves the Grand Hall: warm air is emitted from registers mounted on the sloping floor beneath the seats and rises to maintain a comfortable temperature within the large space. This system is quieter and more efficient than conventional systems that disperse air from overhead, so it won’t compete with performances. HGA collaborated with acoustical and audiovisual consultants McKay Conant Hoover to ensure variable acoustic tuning for the space.